Luminous Lupita! This time, makeup artist Nick Barose went for 20s glamour through a current-day lens. 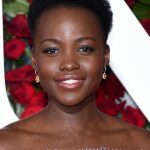 He gave Lancôme Ambassadress Lupita Nyong’o a metallic, smokey eye paired with a romantic aubergine lip. Here, the beauty breakdown. What you think of Lupita Nyong’o’s look last night?